Southend-on-Sea Borough Council serves a population of 175,000 residents, spends £139m a year and employs 1,700 staff to provide a huge range of services to meet the needs of local people. Despite tightening financial constraints, Southend-on-Sea Borough Council continues to serve its communities well, providing high-quality services that meet their changing needs. The authority’s ambitions for the town – to be recognised as the cultural capital of the East of England, to promote a thriving sustainable economy and to have first class services and flourishing, active communities – have not wavered in the face of this challenge. This enables the Council to deliver capital investment projects that will make a real difference to residents and businesses for years to come. Acting on its vision to ‘Create a Better Southend’ the Council continues to invest in building and sustaining community and business confidence in the Borough, encouraging further private investment in Southend - for example the expansion and development of London Southend Airport, helping to generate jobs and build our tourism economy. An ambitious £25m programme of infrastructure projects at City Beach, Victoria Gateway, Cuckoo Corner and Progress Road is helping traffic flow better, lighting columns and other improvements at City Beach are encouraging visitors to stay longer and access to the High Street has improved. Southend Town Centre is now designated as a Business Improvement District, and the town won a prestigious purple flag in recognition of the safety of its night time economy. The Royal Pavilion, officially opened on Southend Pier by HRH the Duke of Kent is another major attraction enhancing the town’s iconic landmark, and the state-of-the-art award-winning Southend Swimming and Diving Centre used by the British Olympic diving team, was another huge achievement. Arts Council awards to Metal Culture, Focal Point Gallery and indeed the Forum: Southend-on-Sea show that the town is now seen as a leading cultural centre and demonstrate that national bodies have great confidence in the local authority. This ability to adapt to changing circumstances and constantly improve services whilst still driving up efficiencies led to the authority winning the title of Council of the Year in the 2012 Local Government Chronicle Awards and the Council continues to gain prestigious recognition for its sustained high level performance. More than 30 teams across the organisation have either won or been shortlisted for a host of different national awards in the last 12 months. 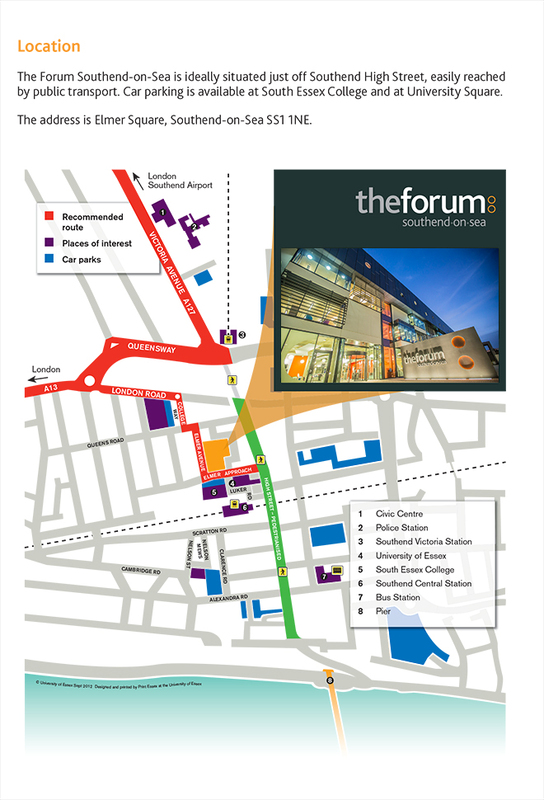 The dynamic development of the Forum Southend-on-Sea demonstrates a landmark achievement of partnership working between Southend-on-Sea Borough Council, the University of Essex and South Essex College to deliver the first fully integrated public and academic library in the UK and cement the role that culture and learning play in creating a better Southend. For more details, please visit: www.southend.gov.uk.